Look for a zillion trillion giveaways and reviews in the next week– I have a lot of bloggy catching up to do and there are some exciting prizes you'll want to be on the lookout for! Happiest of birthdays to Roo! I hope she has a magical, cupcakey day!!!!! well may roo have minny more realy nice b-days. 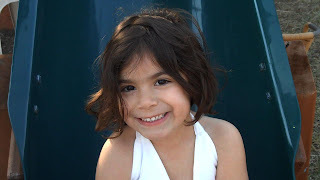 tommrows my little ones b-day party but well she will not be 2 untell the 2nd. Tell Veronica her cousin Brandon said Happy Birthday. And tell everybody I said hi. Wow, the big 0-5! You go girl! That's a beautiful picture of her! White really suits her well.